Step 1. Make up a batch of the cut-cookie dough mixture, rest then roll out until about 0.5cm thick. 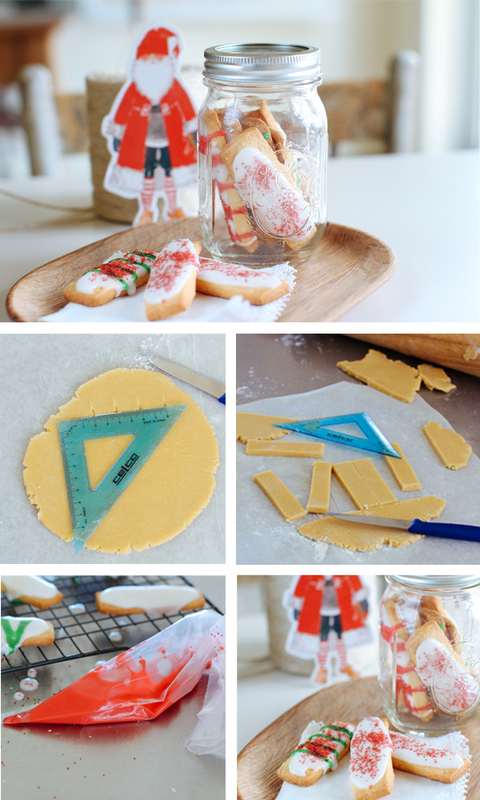 Measure out the desired length and width of your cookies. Ours are 8cmx2cm. Step 2. Transfer your biscuit sticks to a tray lined with baking paper, preheat oven to 180°C (160°C fan-forced) and let the uncooked biscuits rest in the fridge for 10 minutes. Step 3. Bake for 10-12 minutes or until pale gold, transfer to a rack to cool completely. Meanwhile, make the icing by mixing the icing sugar with a tablespoon of water, adding a little more until you reach the desired consistency. Colour a little of the icing red and a little green. Step 4. Once biscuits are completely cool, ice with plain white icing, then let this set before decorating with red and green stripes and a dusting of red sanding sugar. Let this set completely before packing into Mason jars. Flavour the basic biscuit dough with cinnamon, clove and nutmeg for extra festive oomph. You could use any sprinkles that you have in the cupboard for these and then just place a nice big red or green ribbon on the jar. If you like jelly beans then this Jelly bean Easter bark could be shaped into Christmas baubles and given as gifts. These Tiny Teddy Santa sleigh lollies are a fun cooking activity to make at Christmas with your family. These cute Reindeer cupcakes use pretzel and Jaffas for Rudolph’s nose. If you are looking for a simple homemade dessert for kids then this Christmas Yule log is the perfect buffet dessert. We topped them with sweet little snowmen made from ready-made chocolates. These Christmas tree cupcakes are a delicious take-along addition to any party and very easily shared with friends. These Christmas snowflake biscuits are a lovely homemade gift for teachers and friends. They are decorated with pretty glitter decorations. These sweet Christmas gingerbread reindeer are a delicious gift to bake and give at Christmas. You can place them in cellophane bags and tie with a ribbon. These Cranberry and pistachio biscotti are a delicious and sophisticated homemade gift. These Christmas crackles are also a fun cooking activity for kids. You can make them in mini cupcake sizes. They look like tiny Christmas puddings. This recipe was created by Sophie Hansen for Kidspot, New Zealand’s best recipe finder: You can follow Sophie on Local is Lovely, Facebook or Pinterest.